Magnetic therapy (low-frequency magnetic field) involves slowly changing magnetic field with a frequency of 0-50 Hz and a magnetic induction of about 0.5-10 mT. The use of pulsed magnetic field leads to the normalization of the resting electrical potential of the cell membrane and enhance growth of ions traveling through it. It also increases the utilization of oxygen by the cell and increase the energy conversion. A characteristic feature of the magnetic field penetration by all the structures of the system. 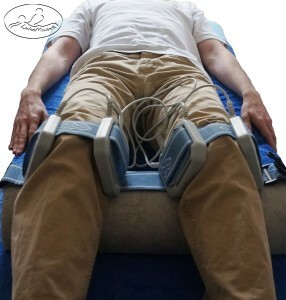 Magnetotherapy is a procedure by which. literature and research, has absolutely proven efficacy and indications for treatment of bone fractures – accelerates bone union. Has a beneficial effect Biostimulative – accelerates tissue regeneration. Magnetic therapy can be used in the acute stage of the disease in children. An additional advantage of this therapy is capable of being performed by a plaster, bandage, clothing and implanted with metal implants or bone anastomosis, if they are not electronic implants. Currently in the office doing treatments magnetotherapy using applicators disk, which affect only the area received therapy without affecting the tissues located outside of the field. • In chronic – field intensity to 10 mT, frequency of 50 Hz. • Diseases of the circulatory system (peripheral circulatory disorders as a result of atherosclerosis, hypertension, coronary heart disease). • Diseases of the respiratory tract (sinusitis, bronchitis). • Gynecological diseases (inflammation of the ovaries). • Dermatological diseases (ulcers and trophic changes of leg, it is difficult to heal wounds). • Early post-surgery neurological disorders. 1. A. Bauer, M. Wisp, Methodological Guide After surgery Selected physical, ed. Markmed Rehabilitation S.C., pp. 209-515. 2. A.Straburzyńska-Lupa, G. Straburzyński, Physiotherapy, ed. 3, PZWL, Warsaw 2007, pp. 439-569. With physiotherapy (massage and physical therapy), I encountered due to injury of the spine. I learned personally about the effectiveness of massage and other treatments in the field of rehabilitation and natural medicine. Now I help others by using the extensive knowledge supported by experience, precision and patience. I guarantee complete satisfaction with my services. Master of Physiotherapy, Therapist Manual, Masseur. © 2015 by LuksMasaż Limited. All rights reserved. Copying images, text or other elements of the website is prohibited.